A General Theory of Love demonstrates that our nervous systems are not self-contained: from earliest childhood, our brains actually link with those of the people close to us, in a silent rhythm that alters the very structure of our brains, establishes life-long emotional patterns, and makes us, in large part, who we are. Explaining how relationships function, how parents shape their child's developing self, how psychotherapy really works, and how our society dangerously flouts essential emotional laws, this is a work of rare passion and eloquence that will forever change the way you think about human intimacy. Drawing comparisons to the most eloquent science writing of our day, three eminent psychiatrists tackle the difficult task of reconciling what artists and thinkers have known for thousands of years about the human heart with what has only recently been learned about the primitive functions of the human brain. The result is an original, lucid, at times moving account of the complexities of love and its essential role in human well-being. A General Theory of Love draws on the latest scientific research to demonstrate that our nervous systems are not self-contained: from earliest childhood, our brains actually link with those of the people close to us, in a silent rhythm that alters the very structure of our brains, establishes life-long emotional patterns, and makes us, in large part, who we are. Explaining how relationships function, how parents shape their child's developing self, how psychotherapy really works, and how our society dangerously flouts essential emotional laws, this is a work of rare passion and eloquence that will forever change the way you think about human intimacy. Thomas Lewis, M.D. is an assistant clinical professor of psychiatry at the University of California, San Francisco, School of Medicine, and a former associate director of the Affective Disorders Program there. Dr. Lewis currently divides his time between writing, private practice, and teaching at the UCSF medical school. He lives in Sausalito, California. Fari Amini, M.D. is a professor of psychiatry at the UCSF School of Medicine. Born and raised in Iran, he graduated from medical school at UCSF and has served on the faculty there for thirty-three years. Dr. Amini is married, has six children, and lives in Ross, California. Richard Lannon, M.D. is an associate clinical professor of psychiatry at the UCSF School of Medicine. 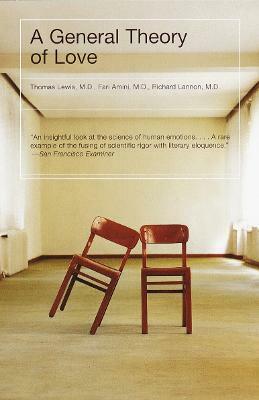 In 1980, Dr. Lannon founded the Affective Disorders Program at UCSF, a pioneering effort to integrate psychological concepts with the emerging biology of the brain. Dr. Lannon is married and the father of two; he lives in Greenbrae, California.